1. Hall of Public Audience: It is also known as Diwan-e-Aam. It is a large hall that stands from the support of two rows of the ornamented pillars and it is open on three sides. The king sits here to listen to the queries and complaints of the people and they also meet guests here. This hall is also popular for its glass work. 2. Sukh Mandir: Sukh-Mandir is also known as Sukh Niwas is also a big hall which is made of sandalwood and ivory. It is situated right side and opposite to the Diwan-e-Aam. This is the place where Kings and queen used to do relax. 3. Sheesh Mahal: Sheesh Mahal is also known as Mirror Palace which is the most beautiful part of the fort. This place is carved with beautiful flowers and also done glass paintings here. It is made for the sleeping of the queens under the stars because they are not allowed to sleep in the open air. That is why this place is built to resolve this problem. It looks like thousands of stars glittering in the ceiling. 4. Kesar Kyaari: This is a Mughal garden which has the splendid beauty that totally differs from the simple garden. It is the part of Maote Lake and it is in the front of the fort. It is built in the star shape and there were many saffron flowers planted in the garden. Now, there are beautiful flowers planted here, because at this time saffron plant can not thrive because of the climate conditions. 5. Light Show: The Light show happen in this fort every evening. The light show theme is based on the history of the Jaipur and the Amber Fort. It continues for 50 minutes in both language Hindi and English. 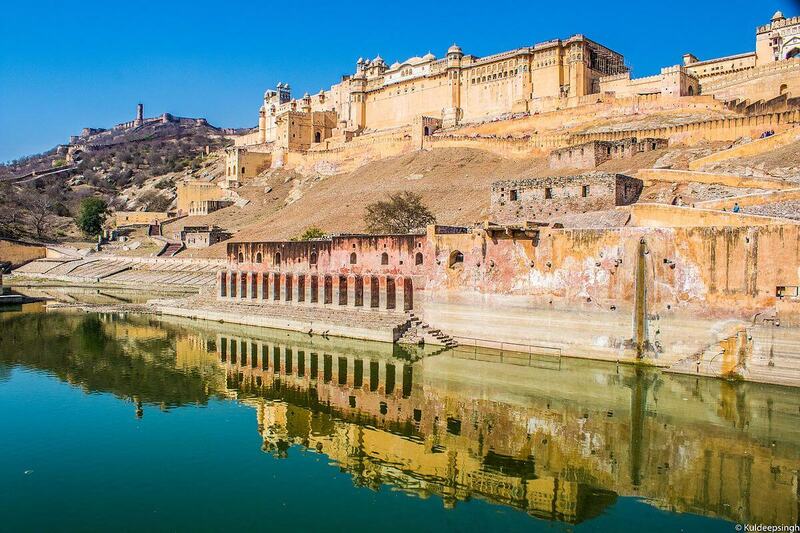 Amber Fort opens from 8:00 am till 6:00 pm and the light show will happen 7:30 pm in English and 8:30 pm in Hindi. The entry fees for the Foreigners is 550 per person and 100 rs. For Indians. Jaipur Car Rental provides Taxi service for jaipur same day tour package. Jaipur Car Rental also provides the Best tour Packages such as Golden Triangle Tour Packages, Rajasthan Tour Packages, Same Day Tour Packages and also provide nearby Jaipur Taxi Packages with car rental Services.